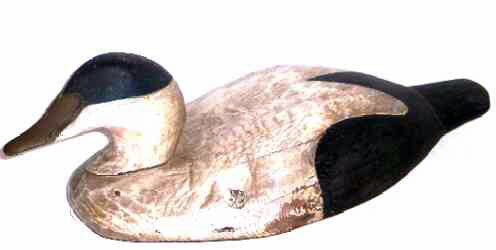 Presented here, a wonderfully folky Monhegan style Eider Decoy. Great form, structurally sound with dowled head and carved mandible. There are few stress lines on the back that are mentioned for the sake of accuracy but in no way compromises the integrity of this magnificent bird. It still retains it's original lead weight and the tie line hooks as it most likely was used in a rig. It is 17 inches long and 10 inches wide.